Unfortunately, there is no known documentation that he ever said or wrote it. Other sources have attributed the saying to Bill Nye or Eli Perkins, both 19th Century American humorists and contemporaries of Twain. However, I have not been able to find the saying in the writings of either of these two. This website is just a sample. Buy the book at the University of Utah Press. To buy the book from the publisher, click on the cover photograph to the left. For information on the book contents and for unpublished illustrations, see the chapter links below. My book did not have room for all the photographs and drawings of the people and places. To view the illustrations, link to the following sections. 16th Century Germany Mining swindles are not a modern invention. They date back at least to 16th Century Germany, where mining frauds were well known. Sir Martin Frobisher Under Queen Elizabeth I, the English made their first attempt to colonize the New World, a gold-mining colony in what is now arctic Canada. Unfortunately, there was no gold in the mine, because it was all based on a fraud by an Italian alchemist living in London. Guinea Pig Directors A “guinea pig director” is a prominent person who becomes an officer or director of a company, but takes no active part in directing the enterprise. George Gardiner George Gardiner swindled the U.S. government by claiming to have a rich silver mine in Mexico. Comstock Lode Nevada’s Comstock lode was the first great silver discovery in the United States. 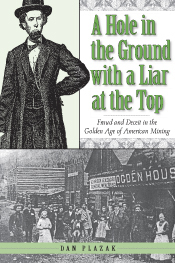 The Comstock lode created a notorious record of numerous, massive, and continued frauds that fortunately has never been equaled by any other mining district. Do you think that you know the history of the Comstock? Take another look. Emma Mine You have probably heard of the famous ski resort town of Alta, Utah. In the 1870s, Alta was famous not for skiing, but as the location of the infamous Emma silver mine, which became an international scandal. Diamonds Like gold, diamonds have a powerful hold on the imagination, which prompted swindlers and fools to start false diamond rushes in Colorado, Idaho, Nevada, and other states. Tin Men America is poor in tin ore, but rich in its history of tin-mine swindles. South Park Before it became the site of the satirical cartoon show, the beautiful high mountain valley of South Park was the site of the infamous “Mount Pisgah hoax.” My book contains the full story told for the first time anywhere. Leadville Discovery of silver high in the Colorado Rockies in 1879 led to a brief but intense round of mine swindling around the newly created town of Leadville. Richard Flower Richard C. Flower was a lawyer, preacher, doctor, and mine swindler. Thomas Lawson Thomas W. Lawson posed as a champion of the common people, but that did not stop him from becoming a multimillionaire from the investments of his deluded public following. Aron Beam Aron Beam was a “process man.” Like the alchemists of the Middle Ages, he pretended to be able to extract gold from common materials by his own secret process. Gold from the Sea Chemists have long dreamed of perfecting a process of extracting gold from sea water. Swindlers instead perfected their method of extracting gold from peoples’ pockets. The Spoilers Political fixer Alexander McKenzie got his obedient crony appointed as a federal judge in Alaska, to steal the best gold mines in Nome. Then McKenzie went north himself to lead his gang of crooks in person. Whitaker Wright J. Whitaker Wright perpetrated mining swindles in Colorado, New Mexico, Canada, and Australia. He became one of the richest men in England, until his empire crumbled. George Graham Rice George Graham Rice, a gambler and former racetrack tipster, was a promotional genius who plundered every mining company he was associated with in his long career. Death Valley Scotty Death Valley Scotty claimed to have a secret gold mine in Death Valley. Julian Hawthorne Novelist Julian Hawthorne, son of novelist Nathaniel Hawthorne, used the famous Hawthorne name to promote rotten Canadian mining companies. Blue Sky Changing public attitudes forced governments at all levels to crack down on swindlers. Frauds of all sorts (including mining frauds) are much less common now, but are not entirely eliminated.